Photo from GP Desert. This member of the Cucurbitaceae family was given this name by Charles Jeffrey in 1962. It is found in Congo, Kenya, Malawi, Mozambique, Nigeria, Tanzania and Uganda, growing in a rich and well drained soil with some to lots of water and some to lots of sun. 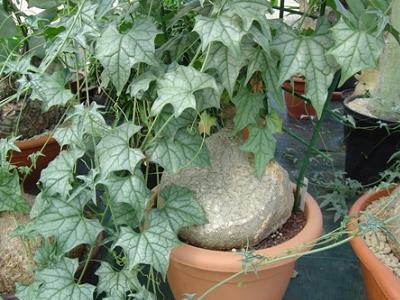 The caudex can grow to 50 centimetres or more, the vines can reach six metres. The flowers are brownish yellow.